TAN Zhao, LI Wenge. Correlation of Serum Uric Acid and Microalbuminuria with Chronic Vascular Disease in Type 2 Diabetes Mellitus[J]. Journal of China Medical University, 2018, 47(1): 67-72. Abstract: Objective To assess the correlation of serum uric acid (SUA) and microalbuminuria (MAU) with chronic vascular disease in type 2 diabetes mellitus (T2DM).Methods The study enrolled 892 T2DM patients. The association of different SUA and MAU levels with the incidence of chronic vascular disease was evaluated. Chronic vascular disease included coronary artery disease (CAD), cerebrovascular disease (CVD), diabetic nephropathy (DN), diabetic retinopathy (DR), and diabetic peripheral neuropathy (DPN).Results With increasing levels of SUA and MAU, the incidence of chronic vascular disease increased. In addition, the level of SUA was positively correlated with the incidence of CAD, CVD, DN, DR, DPN, and total chronic vascular disease, while the MAU level was positively associated with the incidence of CAD, CVD, DR, DPN, and total chronic vascular disease. Multivariate logistic regression analysis revealed that SUA level was an independent predictive risk factor for patients with concurrent CAD, CVD, DN, DR, DPN, and total chronic vascular disease, and MAU level independently predicted the risk of CAD and CVD.Conclusion The levels of SUA and MAU may be reliable biomarkers for prediction of the risk of chronic vascular disease in T2DM patients. FANG J, ALDERMAN MH. Serum uric acid and cardiovascular mortality the NHANES Ⅰ epidemiologic follow-up study[J]. JAMA, 2000, 293(18): 2404-2410. ZAND PARSA AF, GHADIRIAN L, RAJABZADEH KANAFI S, et al. 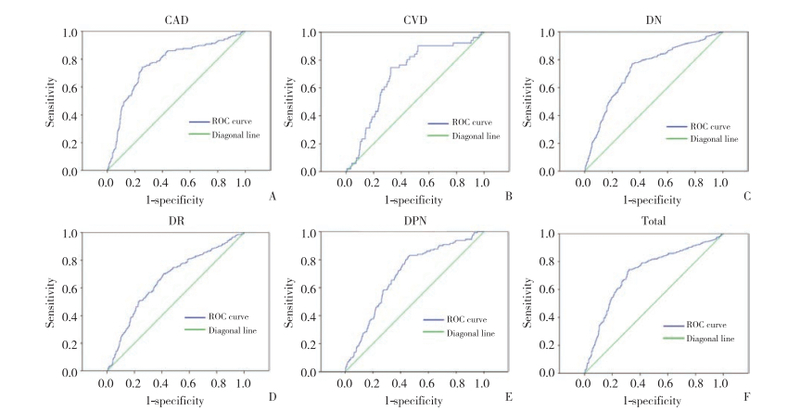 Positive correlation between microalbuminuria and severity of coronary artery stenosis in patients with type 2 diabetes mellitus[J]. Acta Med Iran, 2013, 51(4): 231-235.